Ask the average person what "romantic getaway" means to them, and they’ll likely tell you the usual things, like dinner and wine at sunset, a long walk on the beach, or swimming under a clear blue waterfall. But what if you’re looking for something more? Something that has all the classic components, the beaches, long walks, dinner and wine, and waterfalls, but also offers so much more. Add in some adrenaline pumping rapids, and a Colorado River rafting trip through Grand Canyon can be the perfect way to rediscover, recharge, and rejuvenate your love for one another. Here at Hatch River Expeditions we’ve seen it all. Every year we have couples of all ages celebrating the beauty of their love by taking on the majesty of the great outdoors. We’ve seen wedding anniversaries – all the way from the 1st to the 50th and beyond – we’ve seen awe inspiring proposals, and countless couples simply looking for time away from the kids (or looking to keep the kids occupied). Are you ready for that extra special something to do with that extra special someone? We’ve got you covered. 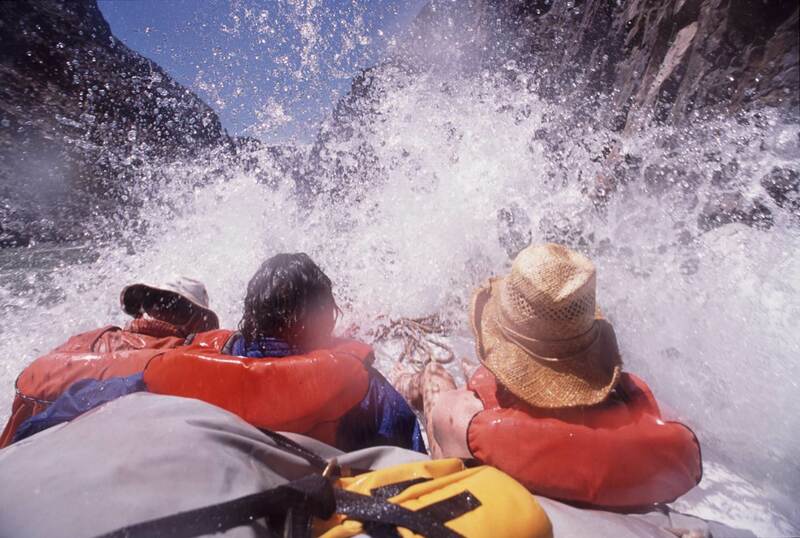 Here are just a few of the many reasons why a river rafting trip is a must for your next romantic getaway. Can you remember the last time you spent an entire day without the constant chime of an incoming email or text on your phone, or the distraction of the television? In today’s fast moving, tech driven world, these peaceful days are few and far between. One of the best things you can expect on your rafting trip is the near complete absence of technology. This means, no work, no interruptions, no distractions. Just peaceful, uninterrupted you time. No more unwanted disturbances during that special moment. Another awesome bonus of being on the river is the escape from the hustle and bustle of the city. During your trip there will be plenty of time to simply hang out and enjoy some hassle free time to yourselves. You’ll meet some really great folks in your party, many of whom will turn into friends by the end, and maybe you’ll see another trip or two along the way. Just give em’ a wave and a warm hello! We are talking about both the beauty of nature and the natural beauty of your partner. As you meander down the river, the canyon will offer more amazing views than you could possibly imagine. The bright stars at night, the unique and abundant wildlife, the incredible rock formations, and billions of years of nature doing her thing will simply take your breath away. But wait until you hit that first exhilarating rapid. When her face shifts from a moment of surprise to a wide smile, and her eyes light up with the sheer joy of adventure, now that’s natural beauty. Add to this the simplicity of ‘getting ready’ on the river your natural beauty can be seen without makeup and in yesterday’s shirt and shorts, in the sand filled shoes and bags, and the soapy river bath in the calm chill of the morning. The ultimate relaxation comes from knowing that someone else has it all under control. And that’s exactly how it will feel on your trip with Hatch River Expeditions. Our guides take the driver’s seat with everything from navigating the canyon to cooking gourmet meals, and making sure everyone stays safe and enjoys the trip of a lifetime. All you have to do is unwind and let go. Whether the kids are left at home or taken along for the ride, a whitewater rafting trip in Grand Canyon will make everyone feel like a kid again. A phrase we never hear from guests – whose ages range from 8 to 90 – is "I’m bored". Parents get the benefit of busy and happy kids, and kids get the benefit of destressed, chilled out parents. It’s a match made in heaven. Not to mention that after riding through thrilling rapids, hiking to crystal clear swimming holes, discovering historical sites and ruins, and savoring a Dutch oven dessert we can almost guarantee that you will be sleeping like a baby. Unless you just don’t want the most perfect day end, but don’t worry tomorrow will be just as perfect. The most overlooked and, perhaps, the most important reason a river rafting trip is the perfect romantic getaway is the concept of river time. While on river time you are not bound by the usual constraints of your day to day lives. River time allows you to spend every moment enjoying nature and each other’s company. Without a deadline, without a care, and just because you want to. It allows you to notice the colors of the sunset as they change from yellow to orange to dark purple. It allows you to really listen to the sound of her voice or to hear the splash of the spring water falling into a shallow pool. It’s the little things in life that are often overlooked, and love on river time is something not to be missed. Visit our website or call today to book your 2016 romantic getaway!